Rose of Arden: Is your memory expired? I awoke this morning in my usual grumpy old curmudgeon disposition. After a cup of hot coffee, life started to take on a slightly more acceptable view. After another coffee and a round of hot buttered toast things were looking marginally brighter. After a third cup of coffee thing were really improving and on the warm side of Arctic. Much as the weather is at the moment! I had to replace my drivers licence recently as the photo-id part had just expired. It seems that we have to do this every ten years. In my case my visage seems to change each time I look in a mirror so there is no chance of keeping up with appearances! So I wonder if I can get me an Arab Style drivers licence. It would be an obvious improvement on the one I have at the moment! Apparently Sainsbury's Finance has found that more than 1.6 million British drivers are carrying out-of-date driving licence photocards. 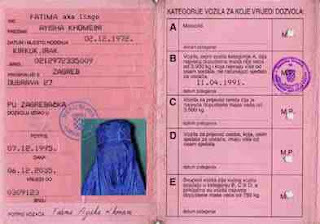 The photocard driving licence was introduced in 1998. So it's unsurprising that those issued with a licence around that time may not remember that they need to update their photograph. It costs just £20 to renew the photo on your driving licence, yet a hefty £1,000 fine if you are caught with an out-of-date one. Around 10 million motorists did not know when their photocards were due to run out. While one in every seven expired licences had been out of date for two years or more. It's not only driving licence photos that can run out. Thinking of going on holiday? Have you checked the expiry date on your E111 European Health Insurance card? Yes, even that has an expiry date but no photo! Ah, its Valentines day again. Yet another day for tenderness and being wrong. I hope you remembered to send a card. Needles inserted under your nails is a very painful alternative option.Women you can't live with them and they're too big to flush.... I'm coming right now, yes dearest, what, no, I'm just looking for my ..... what, where, yes dear I'll get them from your handbag! The Memsahib said this morning "I just had a dream that you gave me a pearl necklace for Valentine's day. What do you think it means?" I said I don't know. However, I've been out and purchased a book entitled "The meaning of dreams". I have wrapped it up in a small package, I'm sure she will be pleasantly surprised!